The EHB is a groomed version of the ISC Bulletin, and contains data for 141478 events from 1960 to 2008. The Engdahl et al. (1998; EHB) algorithm has been used to significantly improve routine hypocenter determinations made by the ISS, ISC and PDE before a new ISC location algorithm (Bondár and Storchak, 2011) was introduced for data year, 2009. 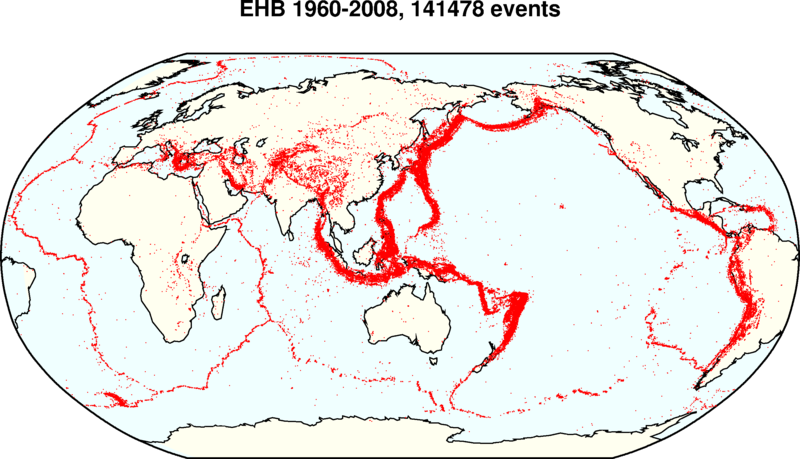 At present, since the EHB bulletin was stopped at the end of 2008, we encourage users to complement the EHB with well-recorded earthquakes from the ISC Bulletin from year 2009 onwards. It is our plan, however, following the rebuild of the entire ISC Bulletin, to release a “clean” EHB-like version of the ISC Bulletin at the beginning of 2015. Limiting the events of interest only to those that are well-constrained teleseismically. Selection criteria for events having ten or more observations at teleseismic distances (> 28 degrees) and a teleseismic secondary azimuth gap < 180 degrees. The EHB algorithm does not recalculate magnitudes; the vast majority of the mb and Ms values are taken from the ISC bulletin, and the provenance of Mw values is the global CMT catalogue. The selection of magnitudes for events prior to 1964 is described in Engdahl and Villasenor (2002). Engdahl et al. (1998) have shown that the model ak135 (Kennett et al., 1995) provides a very good fit to a wide range of seismic phases. The mantle S wave bias of the earlier iasp91 (Kennett and Engdahl, 1991) has been removed. Most core phase times are quite well matched and a baseline problem with Jeffreys-Bullen (JB; Jeffreys and Bullen, 1940) travel times for PKP phases removed. Thus, for global earthquake location there has been convergence on a global, radially symmetric, P- and S-velocity Earth model that provides a good average fit to reported phase arrival times. A direct method to improve seismic event locations is by better utilization of the data. Until recently, standard teleseismic catalogs (ISC, NEIC) relied almost entirely on first arriving P phases for locating events. Many studies have shown that the inclusion of later arriving phases can provide greater constraints on hypocenter parameters, especially focal depth. For events having a poor azimuthal distribution of P-wave arrivals, epicenter constraints are improved by the inclusion of S- and P-wave core phases at critical azimuths. Additional constraints are often provided by these phases because their travel-time derivatives differ significantly in magnitude from those of direct P. Depth to origin time trade-off is avoided by the inclusion of depth phases (pP, pwP, sP) because their travel time derivatives are opposite in sign to direct P. However, a problem with the use of depth phases is that their correct identification often requires knowledge of the event depth and distance. Hence, depth phase arrivals are re-identified after each iteration in the EHB procedure using a probabilistic association algorithm. Probability density functions (PDF) for depth phases, centered on their theoretical relative travel times for a given hypocenter, are compared to the observed phase arrivals. When PDFs overlap for a particular depth phase, phase identification is assigned in a probabilistic manner based on the relevant PDF values, making sure not to assign the same phase to two different arrivals. The travel times predicted by recently developed, radially symmetric, Earth models (such as ak135) are extremely valuable for earthquake location and phase identification. Nevertheless, most earthquakes occur in or near subducted lithosphere where aspherical variations in upper mantle seismic wave velocities are large (i.e., on the order of 5 - 10%). Such lateral variations in seismic velocity, the uneven spatial distribution of seismological stations, and the specific choice of seismic data used to determine the earthquake hypocenter can still easily combine to produce bias in earthquake locations of several tens of kilometers. Tests of location bias globally using a new archive of reference event information and the EHB location algorithm (Bondár et al., 2003) show that most explosions and earthquakes are mislocated by less than 20 km if the secondary azimuth gap (the largest azimuth gap filled by a single station) to observing stations at all distances is less than 180 degrees. Hence, at least in the case of events well constrained azimuthally by reporting stations, mislocation errors introduced by lateral heterogeneity can be minimized. For smaller and/or poorly recorded events, however, there is not much hope of significantly reducing the resulting mislocation error until we can somehow better account for aspherical Earth structure in 1-D earthquake location procedures. The Data is available in RES format which contains both epicentre and phase data or HDF format which contains epicentre data only. Yearly files are available from 1960 to 2006 for both, e.g. 1960.hdf.gz and 1960.res.gz. Please note that in total there are 1.2 GB of data and a dvd can be ordered if you do not wish to download the entire dataset. Bondár, I., S.C. Myers, E.R. Engdahl, and E.A. Bergman (2003). Epicentre accuracy based on seismic network criteria, Geophys. J. Int., 156, 483-496. Bondár, I. and D. Storchak (2011). Improved location procedures at the International Seismological Centre, Geophys. J. Int., 186, 1220-1244. Engdahl, E.R., R. van der Hilst, and R. Buland (1998). Global teleseismic earthquake relocation with improved travel times and procedures for depth determination, Bull. Seism. Soc. Am. 88, 722-743. Engdahl, E.R. (2006). 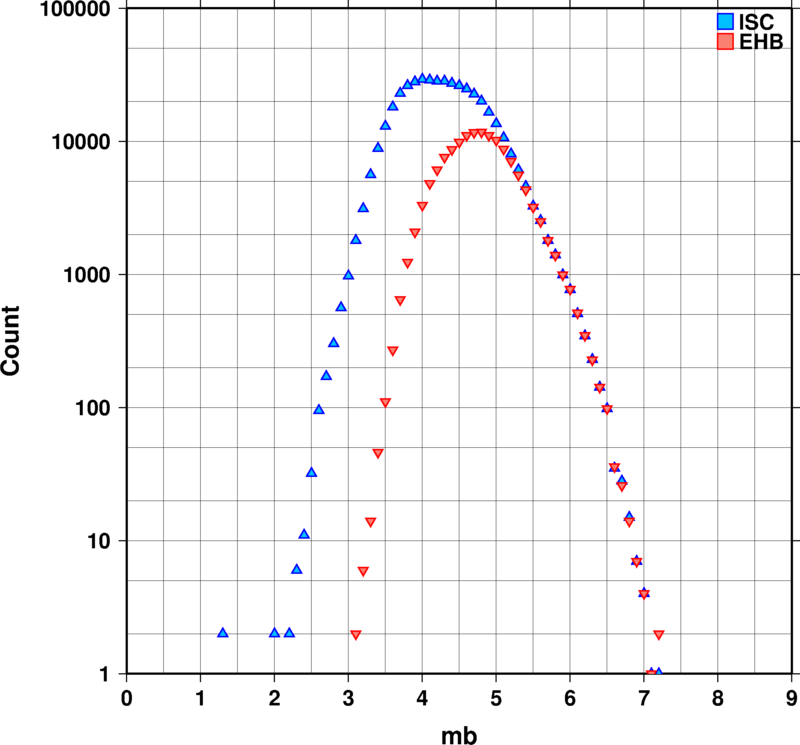 Application of an improved algorithm to high precision relocation of ISC test events, Phys. Earth. Planet. Int., 158, 14-18. Kennett, B. L. N. and E. R. Engdahl (1991). 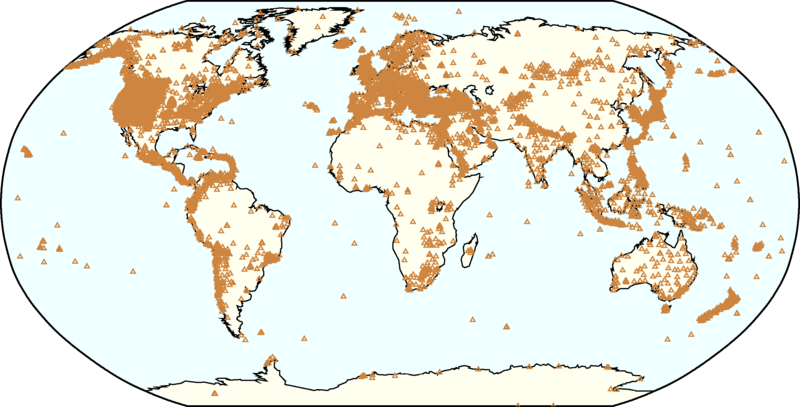 Travel times for global earthquake location and phase identification, Geophys. J. Int., 105, 429-465. Kennett, B. L. N., E. R. Engdahl, and R. Buland (1995). Constraints on seismic velocities in the Earth from traveltimes, Geophys. J. Int., 122, 108-124. Engdahl, E.R., and A. Villaseñor, Global Seismicity: 1900-1999, in W.H.K. Lee, H. Kanamori, P.C. Jennings, and C. Kisslinger (editors), International Handbook of Earthquake and Engineering Seismology, Part A, Chapter 41, pp. 665-690, Academic Press, 2002.
International Seismological Centre, EHB Bulletin, http://www.isc.ac.uk, Internatl. Seis. Cent., Thatcham, United Kingdom, 2009. 4. deliver it to the local post office. The ISC specifically DOES NOT charge you for the data on this DVD that you can always download from the ISC ftp site at no cost.